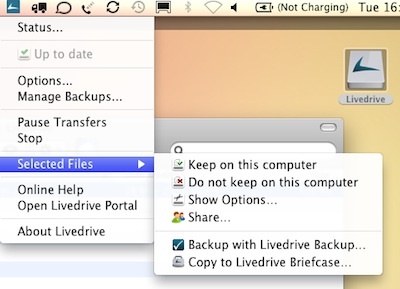 Cloud storage service Livedrive is adding personal media streaming for subscribers at no extra cost. Users will be able to listen to their own music collections on a remote computer, with transcoding handled by Livedrive. Unlike many others in a crowded field, Livedrive doesn't offer a free service as bait - but it doesn't apply caps. So potentially you have unlimited storage with synchronisation across multiple devices for a tenner a month, or unlimited backups for £3.95 a month. Once media files are uploaded they can be browsed by artist, genre or year. Both music and movies will stream at adaptive bitrates, with movies sent from 64kbit/s up to 512kbit/s on Wi-Fi or 384kbit/s over 3G. The additions were devised with the iPad in mind, general manager Jamie Brown told us. Movies will stream full screen on an iPad, doing away with the need for conversion. The locker now integrates with Apple's iWork as well as established online apps such as the Zoho suite. Livedrive says it doesn't pro-actively police for copyright infringements, but they're pretty easy to spot. If somebody links to a file from a music blog there's a noticeable spike in traffic, for example. Users won't be able to stream to each other. Brown says most users don't infringe - it's generally used for backups, or for people exchanging files within the company or with clients. 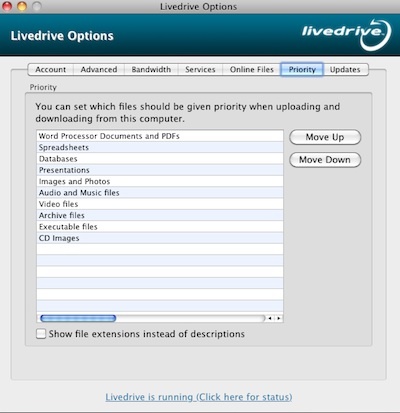 Livedrive impresses with the high degree of technical control it offers users. Here are a couple of examples - priority by filetype, and file-by-file level control. FTP access and unlimited versioning are also quite unusual features. We did find the odd glitch with the Mac client, but are told a new version is imminent. The company claims 300,000 users and operates its own infrastructure. It was founded by FastHosts founder Andrew Michael - which might bring a chill to a few readers, as FastHosts was featured regularly on El Reg for a variety of security and other cockups. Most of these were after it was sold to a German ISP in 2006, though.